Solving a rational inequality means finding values for x that make the inequality true. 1) Type the expression: (x + 2)/(2x - 1) < 0. 2) Type the expression: (x + 2)/(x - 3) < x as "(x + 2)/(x - 3) <= x." 3) Type the expression: (x^2 - 2x + 1)/(x - 1) < 0. 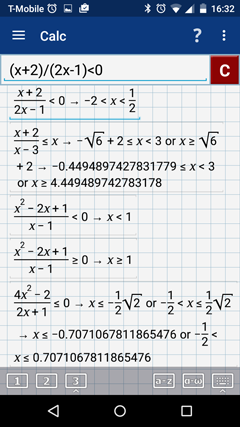 4) Type the expression: (x^2 - 2x + 1)/(x - 1) > 0 as "(x^2 - 2x + 1)/(x - 1) >= 0." 5) Type the expression: (4x^2 - 2)/(2x + 1) < 0 as "(4x^2 - 2)/(2x + 1) <= 0." ​ Type the less than or equal to sign ( < ) by first typing the less than sign and then the equals sign " <= ".